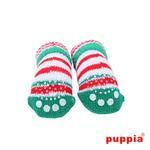 Add comfort and style to your pooch's paws this holiday season with these festive socks for dogs! The Grinch Dog Socks by Puppia are made of Cotton 90% Polyester 8% Other 2% and are cinched in double sections for a secure fit. The convenient skid-free pads help prevent sliding on slippery surfaces. Check out the rest of our great dog socks! Great for pictures and warmth on Christmas morning. 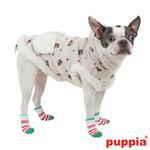 Grinch Dog Socks by Puppia - Green Customer Photos - Send us your photo! 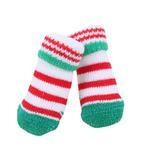 Lily & Lola love how toasty warm these socks are! Fit amazingly well and don’t slide off! The medium is snug but wont fall off our 8 lb boys. These stay on better than any others we've tried. As typical socks, tough to put on over dewclaws but once on they are great! Posted On 11/04/15 by Pam S from Davie, FL Yes, Pam S recommends this product! I bought these for my 11 lb. Maltese, but they look very small. I didn't even bother to try them, think they may be for a toy breed. I also purchased some other styles in small and there is a definite difference in size.